Planning a dinner party menu, for me, is like figuring out an outfit to wear for a special occasion; so many choices but nothing comes together. The (such-a-deal) taupe sheath with a metallic band is very cool but none of my shoes are right. And accessories? Don’t even go there. 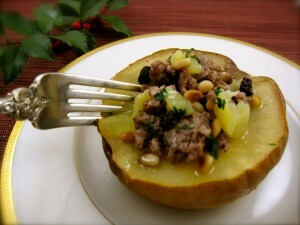 The Baked Quince stuffed with Ground Lamb and Currants is festive but I’m stumped about a side dish. And dessert? Forget about it. Appetizer: Gorgonzola Pear Dip Notes: Stupid simple, but oh so good. Can be assembled in 5 minutes and made the night before; all but the addition of pears, which should be stirred in a couple of hours before serving. Serve with a sliced baguette or Rosemary-Raisin Crisps (or something similar) I’ve enjoyed from Trader Joe’s. 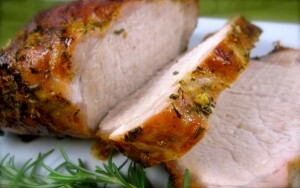 Main Course: Roast Pork with Rosemary and Garlic Notes: How can something so easy taste so heavenly? Five minutes to prep the roast and about 45 minutes to roast. Don’t overcook! Pick your Side(s): Maple-Glazed Butternut Squash Notes: The only thing time-consuming is attacking the butternut squash. I prefer the slices but you could save time and use the pre-cut cubes. Balsamic Red Cabbage Notes: Buying a bag of sliced red cabbage makes this recipe a cinch. 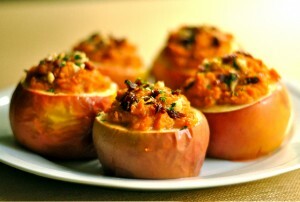 Baked Apple stuffed with Orange-Scented Sweet Potatoes Notes: OK. A tiny bit more involved, but they can be made well in advance to baking, and they are nirvana with pork. Sauteéd Chard and Currants: No recipe for this, it’s so easy. Simply remove greens from stems and sauté chopped stems in butter or olive oil with currants until almost tender. Stir in chopped leaves and season with salt and pepper. Using chard with red stems looks quite festive on the plate and the sweet currants are delish with the pork. 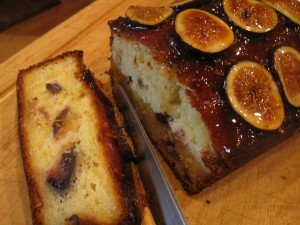 Dessert: Yogurt and Fig Cake Notes: I love this cake and it’s the simplest scratch-made cake I’ve ever made. It may be made a couple of days in advance and freezes well. Substitute frozen or dried figs if you can’t find fresh. 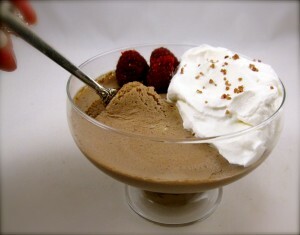 I’d go the distance and serve this topped with whipped cream infused with Grand Marnier. Cocktail: Lucy’s Pig Punch Notes: This is a yummy whiskey and apple potent. But to keep thing really simple, serve a creamy Chardonnay with fruity notes, particularly apple, before and throughout the meal. Proposal #2: A bit more involved, a bit more classy-sassy, but most of the prep work may (and should for survival) be done well in advance. 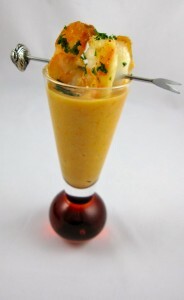 Appetizer: Sherried Shrimp Bisque Notes: I love serving appetizers in shot glasses! The bisque be made a couple of days in advance; it ages well. 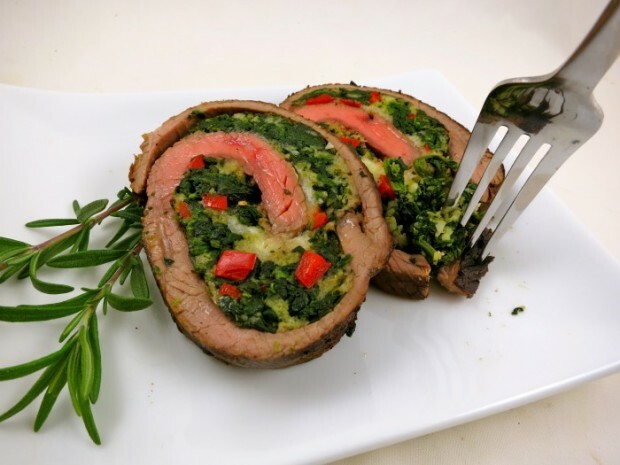 Main Course: Flank Steak Florentine (header photo) Notes: Pretty on a plate and may be rolled and prepped the evening prior to cooking and serving. If you prefer your beef cooked medium or well-done, make this Standing Rib Roast instead. The sides listed below are compatible for both. Flank steak toughens the longer it cooks. Pick your Side(s): Roasted Garlic Mashed Potato and Mushroom-Leek Casserole Notes: Can be made a day in advance. Fabulous with beef. Portobella Mushrooms Caps stuffed with Roasted Garlic Mashed Potatoes Notes: Can be made 3-4 hours in advance. Tidy little package. Roasted Brussels Sprouts with Chanterelles and Bacon Notes: Omit the Chanterelle and Bacon Sauce if you’d prefer the dish less rich. 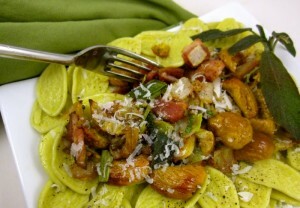 Pasta with Roasted Chestnuts, Bacon and Fried Sage Leaves Notes: Save time by purchasing roasted and peeled chestnuts. Dessert: Chocolate-Rum Mousse with Whipped Cream and Raspberries or Ginger Molasses Bundt Cake with Lemon Curd Notes: The mousse can be made 24 hours in advance; the cake several days in advance. Cocktail: I’d serve a classic Manhattan made with American rye whiskey, sweet vermouth and orange bitters–grated fresh nutmeg would lend a holiday note; and a solid Cabernet with dinner. 2 Responses to A Million Recipes and Nothing To Cook. Thanks for all your inspiration and yummy recipes. Can’t wait to try a few! As always, it is a pleasure to share my brainstorming with you!